Flickr has published a 2015 Year in Review that again crowns the iPhone as the most popular camera, used for 42% of photos uploaded, based on EXIF data analysis. iPhones finished ahead of the Canon EOS, used for 27% of uploaded photos, and the Nikon D, used for 16% of uploaded photos. The photo sharing website's cameras page lists the iPhone 6 as the most popular camera in the Flickr community, trailed by the iPhone 5s, Galaxy S5, iPhone 6 Plus and iPhone 5. Apple is the most popular camera brand on Flickr overall, ranking ahead of Samsung, Canon, Nikon, Sony, Motorola and LG. iPhones have been the most popular smartphone cameras on Flickr for several years, which is largely unsurprising since DSLRs and some point-and-shoot cameras cannot be carried around as easily. 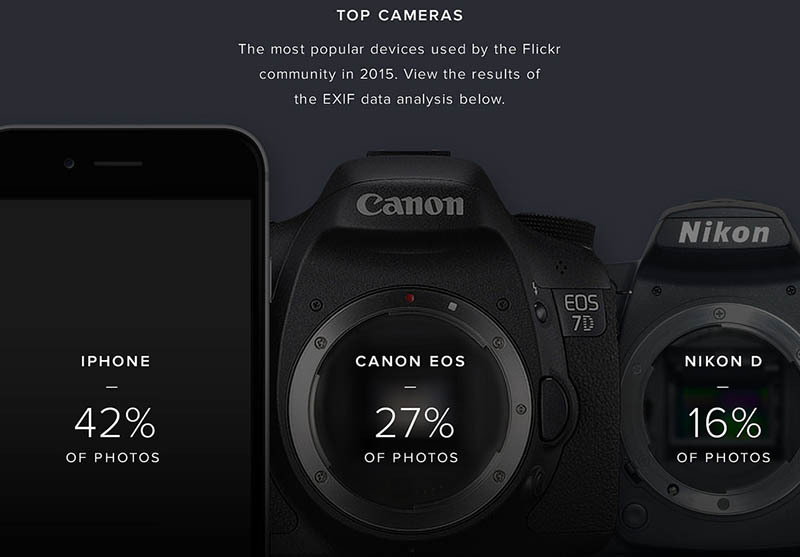 In January 2015, Apple eclipsed Nikon to become the second most popular camera brand on Flickr. No it isn’t. It might be the one a friend has that zooms into the mountain a mile into the distance that your iPhone can’t pick up. Yes my friends usually cary telescopes with them. Apple, with 23 models, is more popular than Samsung, with 276 models. Makes me wonder how accurate the results are. What would happen if they compared all iOS cameras to all Android cameras instead of specific brands? Why would you wonder about the accuracy of the results? They are what they are. The report is about the most popular camera. My Canon DSLR is better than my iPhone and has lenses worthing 5 iPhones.... But most of the time I don't carry my DSLR with me while I'm carrying my iPhone everywhere. But I know, you HAVE TO downplay Apple, even with a post with so little meaning as this. it is pretty much a no brainer......they are using the info that cameral uploads when it sends to FLICKR......no real chance of messing that up. Of course more people use their phones for everyday pictures. Especially if you are not a photographer. True, but what does that have to do with anything? Flickr is, at least ostensibly, an art photography site. The photos posted there will, therefore, tend heavily toward those the person who took them considers to be artistic. And people who are taking artistic photos (as opposed to "cool, look at that", or personal-event photos like at a party or family vacation) will very disproportionately tend to use fancier cameras than the population at large. In fact, they probably tend to use fancier cameras when taking artistic photos more often than they do when they're taking personal photos. I, for example, am much more likely to get out my big camera (if it's nearby) to take a beautiful sunset than to use my iPhone, but I'll be more likely to not bother for a quick family photo. They're also more likely in general to even own a fancy camera--it's getting to the point where people either own a fairly fancy DSLR/mirrorless camera, or they just have a phone, with no in-between. And on top of all that, nothing about Flickr has to do with the "mobile picture market", nor does this article or Flickr's writeup claim anything of the sort. Some Flickr photos are no doubt studio photos, and depending on your definition of "mobile" I expect very few of the photos published there qualify at all. Basically, yes, of course Flickr doesn't represent the overall camera or number-of-photos demographic at all. It's not supposed to, it doesn't claim to. What's interesting is that an increasingly number of people consider their cell phone camera good enough to take artistic photos with and post them to an art photo sharing site. I think that the main reason is down to the fact that with the new Flickr app it automatically uploads your phone pictures privately to Flickr for safe keeping. This way has meant that I have ~500 pictures from DSLRs and scans and 2000+ from my iPhone even though only a small selection (5-10) are public compared to the hundreds of DSLR shots.